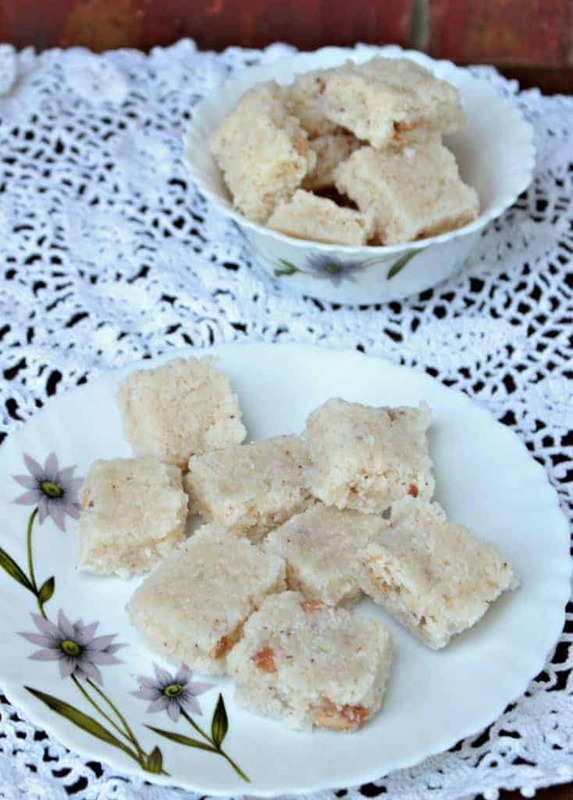 This chewy and delicious Thengai Burfi / Coconut Burfi is made with grated fresh coconut, sugar and some nuts to flavor. 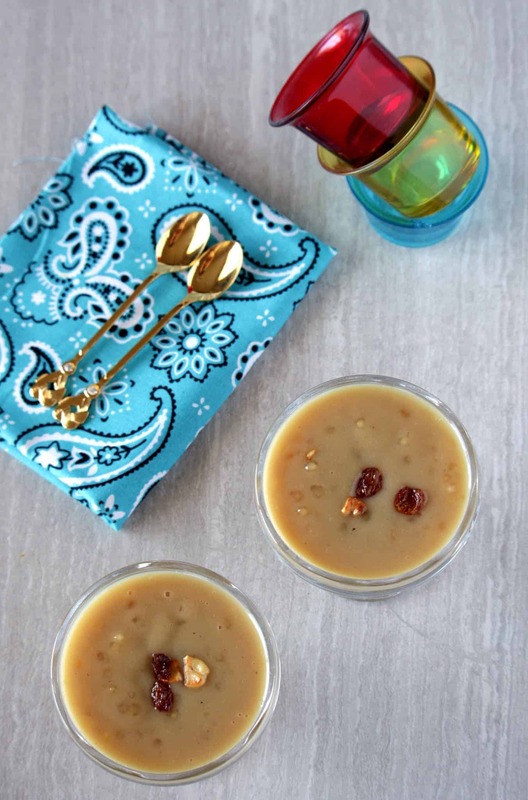 A quick and easy dessert that is ready in no time. 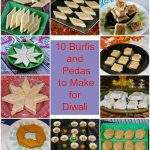 This is one of the other sweets that I prepared for Diwali this year. Making this was a last minute decision and made almost out of impulse, but I am glad I did. My little one who is a little choosy about what he eats, loved this Thengai burf/ coconut burfi. That is when I realized that it has been a long time since I made Thengai Burfi. 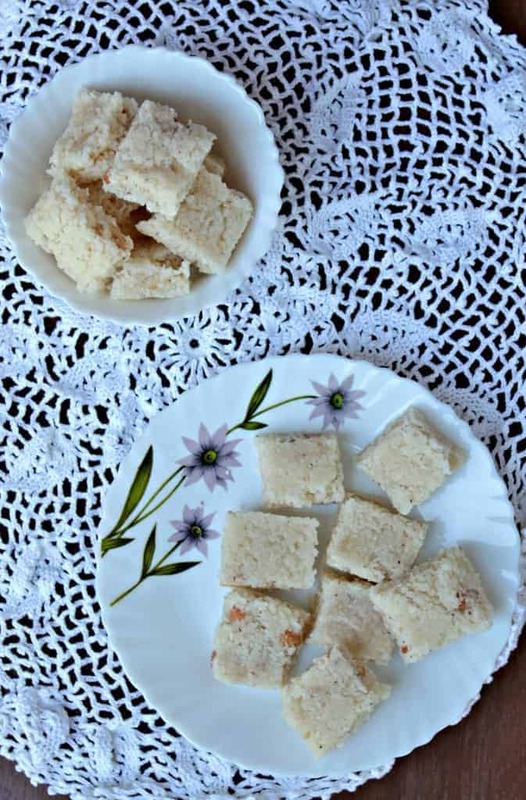 I have to admit that Coconut Burfi is one of my favorite and I look forward to those days of having extra coconut gratings just to make this. The month of October was filled with festivals and happening at home. During those days for the rituals and pooja, we buy coconuts. Just out of fear of not having chosen the right coconut we end up buying multiple coconuts. Yesterday I saw that we had 4 huge coconuts. I asked my husband to crack them open to see what was good and I thought I would grate them and freeze, like I usually do. Fortunately this time each and every coconut was good and that’s when began my painful job of grating all of them. Once grated, there was a huge pile of coconut staring at me. 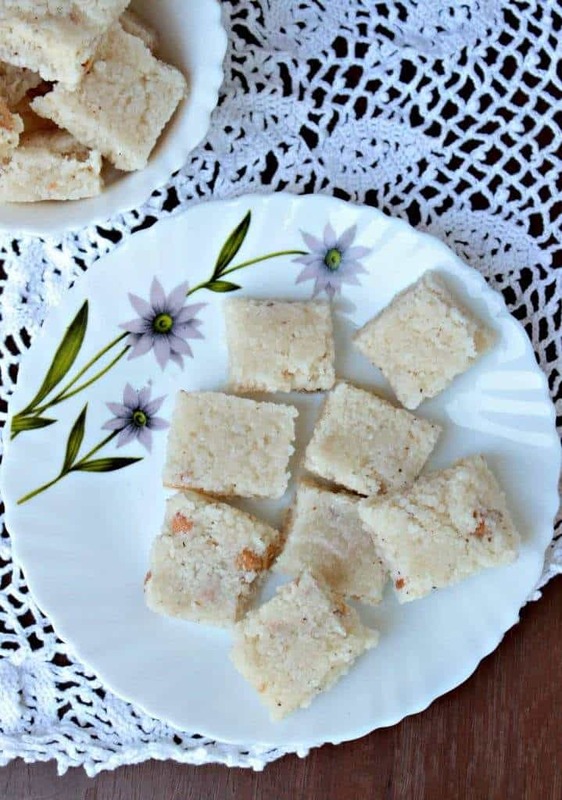 Instead of freezing the whole lot of coconut, I decided to make some burfi and then freeze the rest.I have this book of mallika Badrinath called the Traditional sweets. 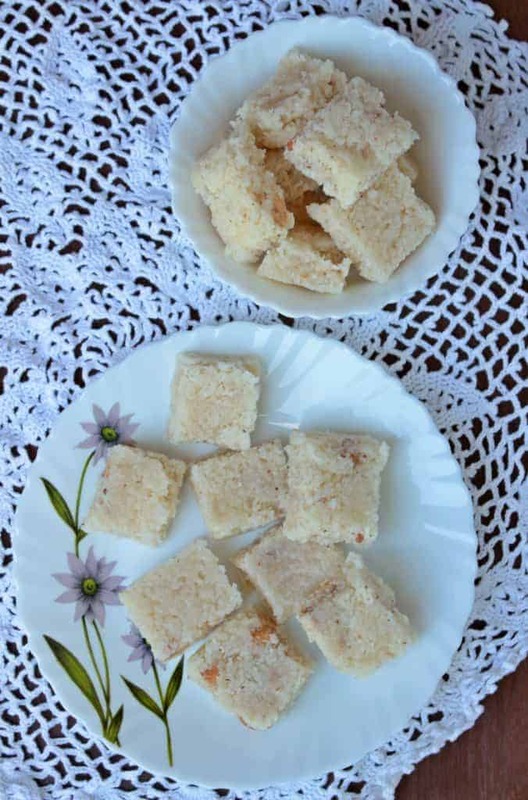 I used her recipe to make this burfi along with few hints and tips from my mom. The key to getting a pure white burfi is to make sure we use the coconut free of any brown skin and also to cook it right, so the color does not darken. 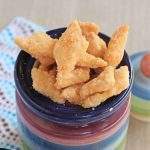 It is a very simple recipe made with just a few ingredients. Grate the coconut and make sure you grate them in such a way that there is no brown skin in the gratings. I grated the top of my coconut and then took out the gratings for the burfi and then grated the remainder of the coconut. Measure out 2 packed cups of coconut and keep it aside. In a small pan, heat a teaspoon of ghee and fry the cashews. Keep it aside. Grease a platter with ghee and keep it ready. In a wide pan, add the sugar and water and let it come to a boil. Let the sugar syrup come to a soft ball stage. This is a stage when you drop a little bit of syrup in cold water, it forms a chunk and you could form a soft ball out of this. 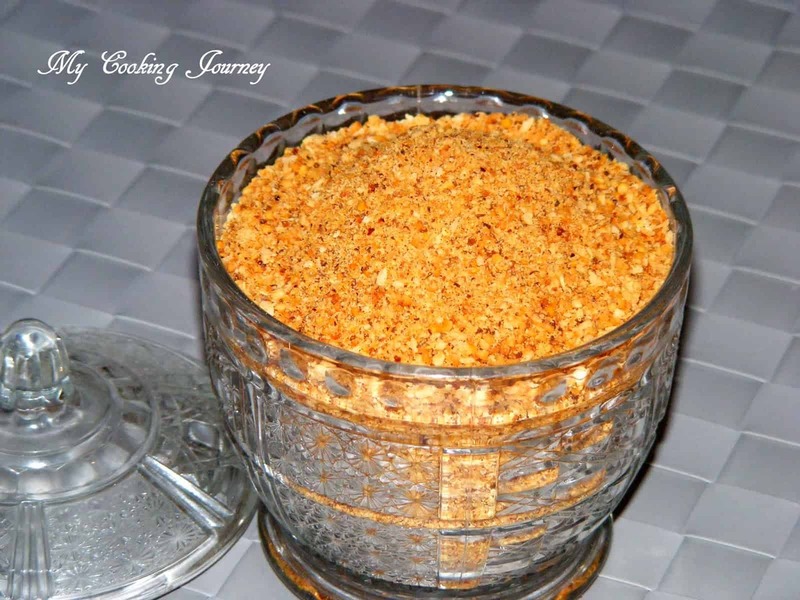 At this stage, add the grated coconut to the syrup and mix well. The syrup will liquefy a bit after adding the coconut. Keep mixing the mixture. 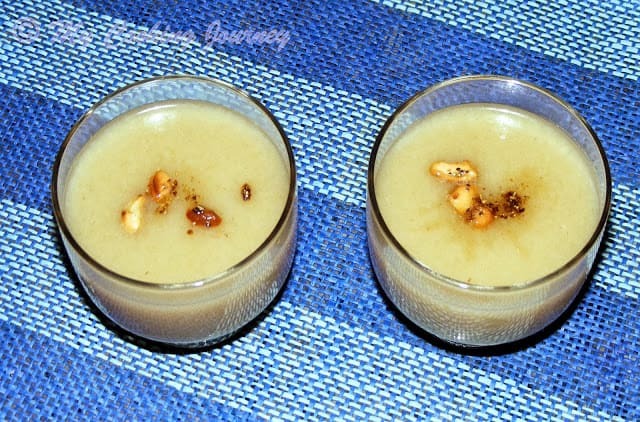 Now when the mixture bubbles up and thickens a bit, add the fired cashew and the remainder of the ghee. Keep stirring until the whole thing comes to a thick mass and starts leaving the sides of the pan. At this stage drop the burfi into the greased pan and level it out with a spatula. When the burfi is still warm, make cuts in the burfi. When entirely cool, remove them and store it in an air tight container. 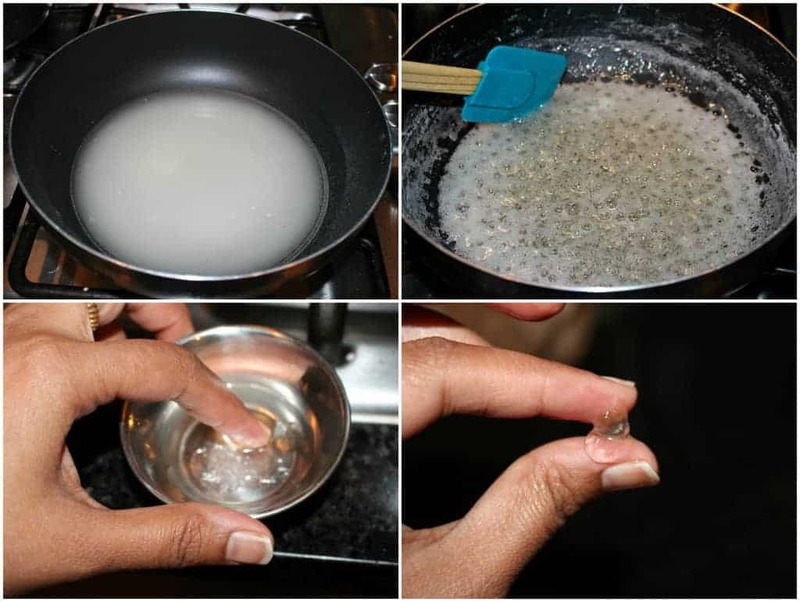 The sugar syrup when allowed to come to a soft ball stage helps in quickening the process. 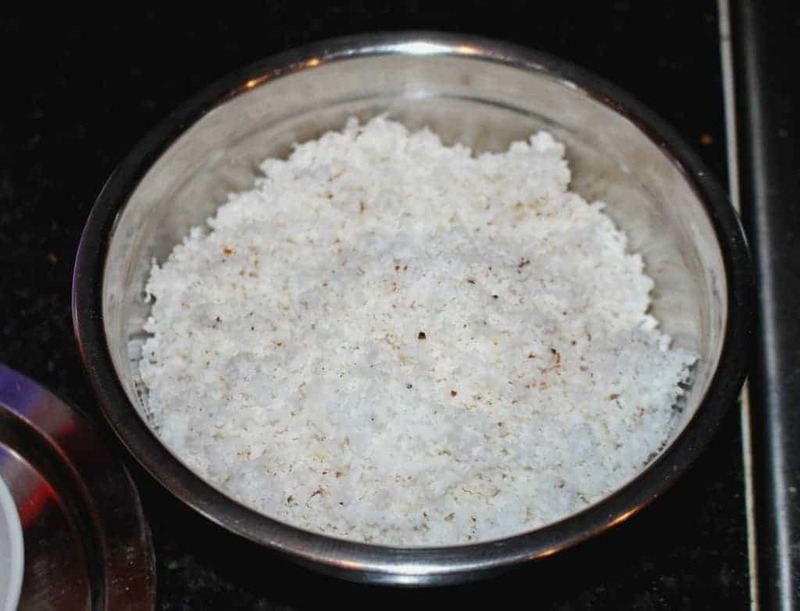 The sugar and coconut could be mixed together in the beginning as well, but it will take quite a bit of time to thicken. The last stage is very critical. 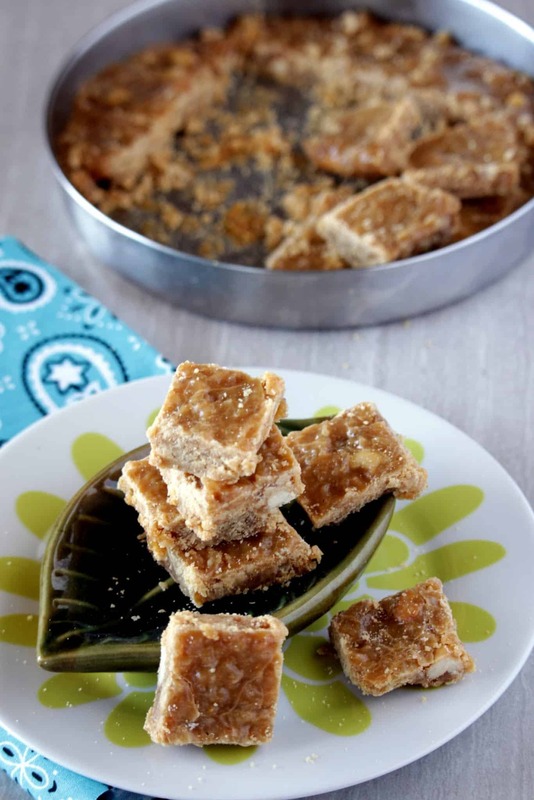 If the burfi is taken too early, it will be very chewy. 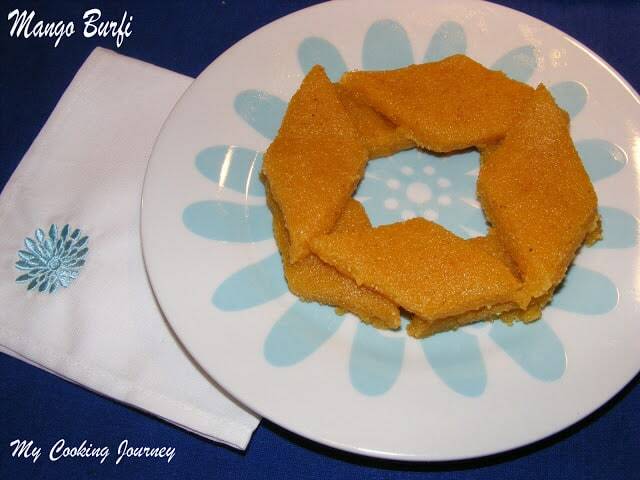 If it is left too long, the burfi will become very crumbly. To help you figure out the right stage, keep looking for the mixture to start to leave the sides of the pan. It will also start to change color slightly. This is the time when it has to be poured on the greased tray. 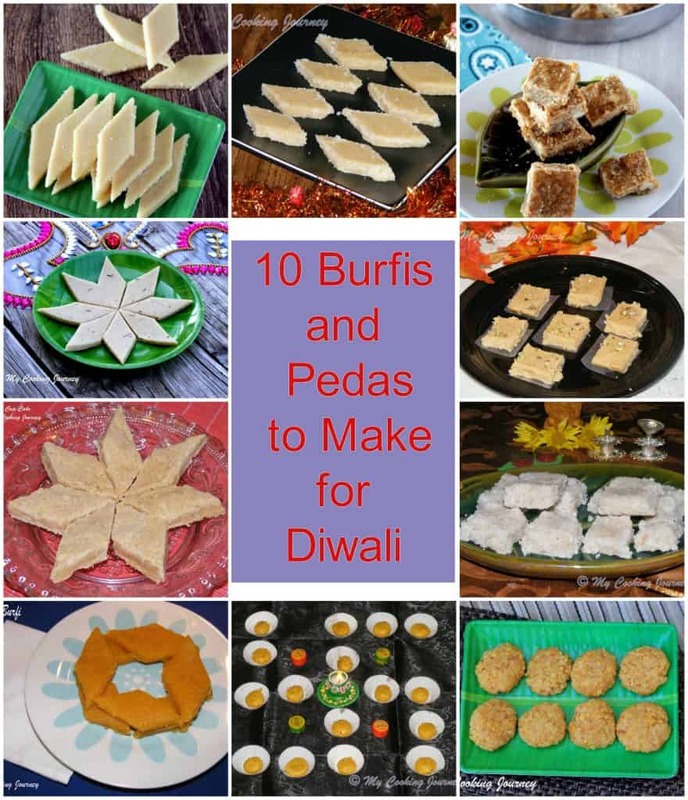 The burfi is beautifully made and I am really fond of this mithai . Now you are tempting me . I could eat so many pieces of coconut burfi. I love the one made with fresh coconut as opposed to the desiccated one. I also like your explanation as to how to make the syrup. 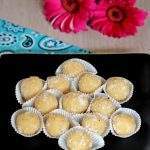 Those coconut burfi look perfect Sandhya. Prefectly sliced ultimate burfis, i love these burfis to the core, irresistible and am drooling here. 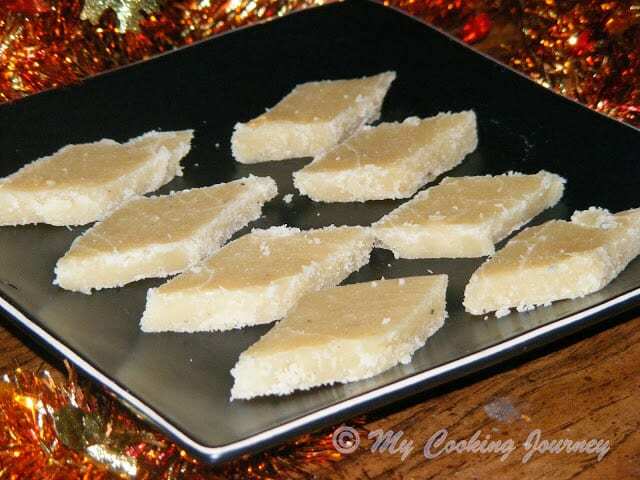 Coconut barfi looks so amazing and totally delicious. I shall try it soon your way as mine always become chewy. 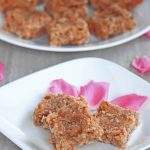 My favorite burfi since childhood! !